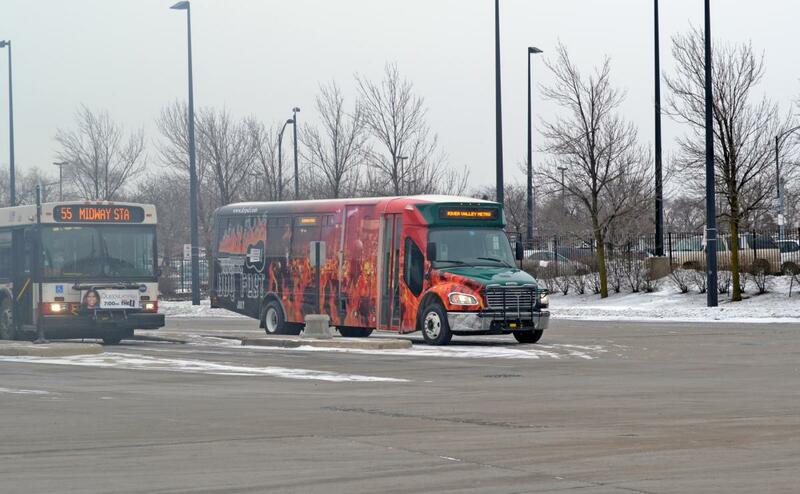 River Valley Metro of Kankakee started a new commuter route from Manteno to Midway on 1/4/2014. There are 6 round trips during the week, 5 on Saturday and 3 on Sunday. The bus loads at the CTA/Pace terminal. Fare is $2.00 per ride. Connections can be made in Manteno to Kankakee. This is in addition to the route that operates from the Metra Electric at University Park. That looks similar to the type of cutaway bus formerly used in Hammond before that transit system was dissolved a couple years ago. Does First Transit happen to operate River Valley Metro? I did not happen to notice. Coming to think about it, whoever the contract operator probably is irrelevant, as any Hammond equipment would belong mostly likely to the regional planning commission or maybe to the Regional Bus Authority. It was not indicated that the cutaways were owned by the contractor. They only thing that could be said here is that there are big cutaways with digital signs. Update: Looking at River Valley Metro's minutes page, the agency apparently owns its own buses (there are references to receiving grants for buses and authorizing scrapping others). However, this document indicates that First Transit hires the drivers. I brought that up because at least one, possibly two, of Hammond's old cutaways were used by First Transit when they had the contract to operate buses for a transit system south of Pittsburgh (Mid Mon Valley Transit Authority). Instead of the buses being registered to the transit authority (with non-expiring "MT" (Mass Transit) tags), they were registered to First Transit with "BA" (bus) tags. Take that for what it's worth. Unless they were on capital cost of contracting, I assume whatever agency in Indiana must have sold them. The Optimas had decals that they were owned by the NW Ind. Regional Planning Commission, but obviously aren't needed by HTS or RBA at this point (but also might be near the end of their service life). Hidden under where you classified this is that 24 Optimas are on the scrap list. CTA made a big deal that it sold about 20 downstate, but everything else must have been scrapped, and to that extent, state taxpayers took it on the chin (as the purchase was with state money). Of the 5 Optimas that went to River Valley Metro in 2015, only 510 matches their active fleet list (see page 35). I supposed the remaining four were for parts, but then I Noticed there is a 507 is on RVM's active list, and also CTA's 2016 scrap list. So my impression that RVM's Optimas kept their CTA numbers must be incorrect. So my impression that RVM's Optimas kept their CTA numbers must be incorrect. Other what's the deal with 507 the number of buses listed as 2005 Optima agree on both lists, so I would bet on your impression. This also agrees with this post, citing the Sun-Times, of 5 to River Valley Metro. The Sun-Times article said there was also buses for parts. What doesn't add up is if you compare the numbers in the 2016 dispositions sheet to those in this post, only 20 buses must have gone downstate, not 30, as there are 23 to Sims, again not counting 507. Maybe Newsradio 780 goofed. The posted ordinance, of course, does not have the exhibit of fleet numbers. Update: Based on pictures on their site, with fleet numbers with leading 0s. I suspect they use a year based numbering system, and these are considered 2005 buses. 0501-0509 came from Indygo in 2010 for $1 each. I'm not sure where @Pace831 got the linked report, but it says the source stated under the table is RVMMTD 2016. Either it's wrong, or the CTA ones didn't last long. Do you have any more insights? Looked at the roster again. They bought the 9 Indygo Opus in 2010. These were new in 2005 as 2501-2509 at Indygo and I assumed they became 0501-0509 at RVM. Actually they were 11c each, $1 for the batch! I saw on the web an Opus numbered 0510 and assumed that this was an ex-cta one. Information on the RVM website said four of the five vehicles entered service so I assumed they were 0510-0513 even though they were 2006 models. The 4 ex-cta vehicles are almost certainly numbered 601-604 at RVM and are still all in service. These were new in 2005 as 2501-2509 at Indygo and I assumed they became 0501-0509 at RVM. Of course, this is not verified. One would have to check that some of these (either the CTA or Indygo) didn't make the 600 series. From what you say, the conclusion may be drawn that the CTA ones did. I'm not sure where @Pace831 got the linked report, but it says the source stated under the table is RVMMTD 2016. Either it's wrong, or the CTA ones didn't last long. I found it here on River Valley Metro's website. I rode both 500s and 600s in Spring 2016, but I didn't remember which was which. I do have pictures of the inside of one of the ex-CTA ones, but unfortunately the number wasn't visible. The blue seats with black inserts and the decals inside left no doubt that it was once a CTA bus. Look at RVM's website , which has a picture of 508. It is a 35' bus, so that one must have been an Indygo one. Also check out this picture of 601, in which the blue seat handle is visible if you look closely. That means the only anomaly is what 510 is. I agree that's the situation. What seems unexplained is that they are short 3 500s and 1 600. I suppose, though they could have been the parts buses.CPTDB, FWIW, says that the Indygos were 34 models. Obviously, my speculation about the 2 507s is out the window. There is a shot of 0510 at the end of the 15 years of public service video on the website. It is clearly a LFB-34. So either they did not number them sequentially or they got another 2005 LFB-34 from somewhere else. Looking on the CPTB site it seems all other 2005 Optima's listed were of the shorter length. 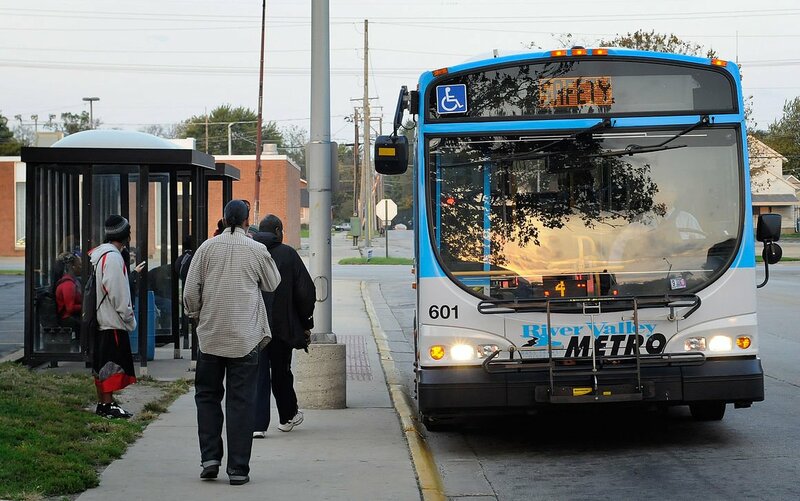 To what I linked said "Indianapolis Public Transportation Corporation 2501-2509 are 2005 Optima Opus LFB-34 buses." On the Illinois page, the link to River Valley Metro is red, indicating no page with text. According to Andre's list of 2015 departures, 510, 516, 523, 527 and 540 went to RVM. 516 was one of the two Ventra buses and may be the one that did not enter service. - Midway commuter route extended to Bourbonnais. The buses have to deadhead there anyway, so why not. - St. Vincent transfer center is eliminated, despite the plans from a few years ago to build a modern facility there. I'm sure they couldn't get state funds for that, either. - Bourbonnais Metro center is clearly intended as more of a park n ride for the two commuter routes, and less of a transfer zone, which is basically how it functions now. -Northfield Square Mall has more importance as a transfer stop, effectively replacing Metro Center for transfers. - I guess route 12 isn't coming back, although the 6/7 split partially covers that. - Overall these are good changes that should improve travel time. Especially the 9 extension to the mall, so you can now get from Kankakee to Manteno on 2 buses instead of 3. Catching up on reading River Valley Metro's board minutes. The following is from September and October. "Bus Purchase: The original plan authorized the purchase of 3) 35’ buses and 1) 30’ bus. The 30’ models are no longer available, and the authorization needs to be modified to purchase 4) 35’ buses instead." "We recently acquired two 1999 Gillig buses from Rock Island at no charge to supplement our fleet since we have three Optimas out of service needing engine replacement. Unfortunately, it was discovered today that, while the buses look great and run very well, their frames are rusted out and they are not safe for use." The bid is back on this vehicle purchase that is part of the Bloomington Consortium. We will order 4 buses at approximately $417,000 each with expected delivery late in 2018. All necessary information has been provided to IDOT." It also sounds like the recent service changes have had mostly positive results. The bid is back on this vehicle purchase that is part of the Bloomington Consortium. We will order 4 buses at approximately $417,000 each with expected delivery late in 2018. FT owned th Hammond buses. Several moved to UofC shuttles. Depends which ones. The Optimas has placards on them that they were owned by the Planning Commission, and there were articles that the RBA picked up some cutaways. Some of the yellow and blues may have belonged to the contractors, although one of them was a Coach USA affiliate. I guess a latter one was FT.
Cutaways 506-512 series landed at Hyde Park after Hammond closed. These were the very last buses HTS ran. The yellow/blue Optimas were an earlier contractor - not sure who but not FT (or FS?) who had the cutaways. Each time contract changed, fleet changed. Again, those were RBA buses. Obviously, it had to sell them off when it folded. Only the yellows and blues were owned by the contractors. As I said, there were placards on the buses. The Progressive ones had Coach USA ones on them. The Optimas had Owed by NIRPC, which separate NIRPC numbers. There were also articles that NICTD had to kick in some capital money and get an emergency assignment of a Houston option because Progressive pulled its buses. So, I don't know where you got the idea that the contractors owned them.